The Long Point Poetree emerged from an idea captured from a garden centre nursery in Palm Springs in the early 2000’s. 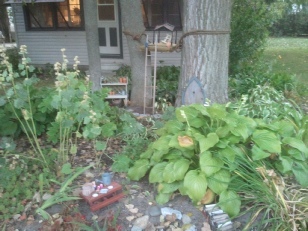 My sister, Bev, is an avid gardener and while there had seen a tree with a few framed poems hanging from it. It planted seeds in her imagination. We have been ever enhancing a garden surrounding our family cottage at 64 Erie Blvd on Long Point since we inherited it in 1996. When Bev’s daughter was just 6 (now 21), we created a gnome garden at her request under a large cottonwood, first with a little garden bench which I built. Over the years since my sister-in-law Rita has tole painted doors and ladders and we’ve all added little tables, chairs and other gnome-sized items built by us or collected over the years from various garage sales. It has delighted passersby for many years. 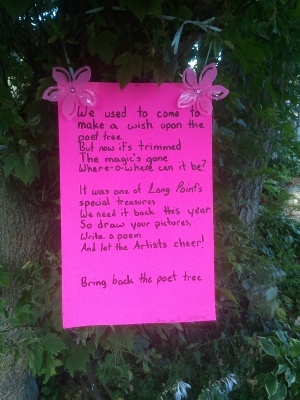 So when Bev told us that she wanted to dedicate the west corner tree of a dozen trees surrounding our little cottage as a poetree, we went right to work devising a system to invite the local community to display their memories of Long Point. Rita put her talents to work tole painting a sign, the Long Point Poetree was born. We hung zip lock bags from a low hanging branch with invitations to visitors to hang their thoughts of Long Point on the tree. 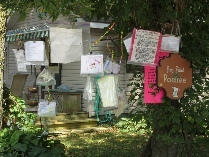 Each year since we have watched the number of poems grow and visitors stop by the tree enjoying all the little poems, adding more or trading trinkets for Long Point beach treasures or art work they have created on their vacation. At the end of each season have carefully collected and added them to our growing binder of Long Point memories. And now we get to the “Prosthetic” period of our little tree. 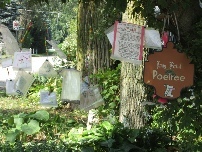 In the fall of 2011, the little Poetree was amputated by Norfolk County. We had just taken down the poems and packed away the sign in the fall when without notice, this low branch of a tree that was on our property, not the county’s, was not just trimmed but unceremoniously chopped off to make way for the garbage truck. We learned of its sad demise from our neighbours. By then, there was nothing we could do. So the next summer 2012 the Poetree ceased to be … or so we thought. 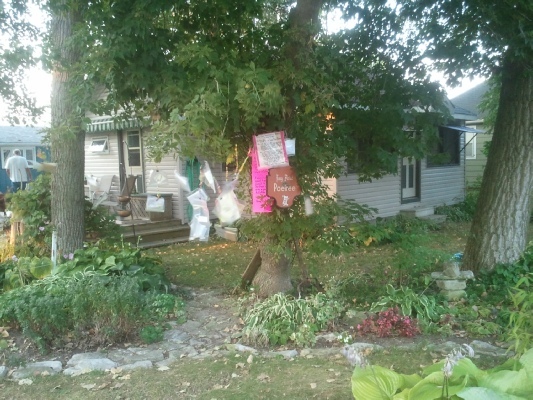 But in the summer of 2013 we found a bright pink sign strapped around the trunk of our tree from Olivia, 10, from Etobicoke pleading with us to bring back the poetree. We were happy to be reminded that although Norfolk took it’s living limb, they could not take our Long Point Poetree’s spirit. 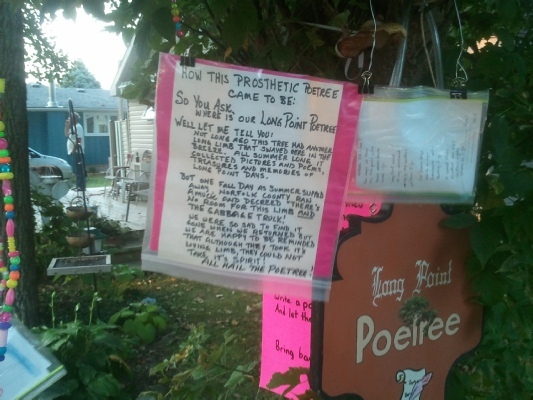 So now the “Prosthetic” Long Point Poetree has been erected and will be each summer for all to enjoy. Thank you Olivia for your enthusiastic reminder. hanging with friends and hoping the summer will never end!